It is replaced by the Honeywell Granit 1911i. 4820i 2D imager from Honeywell offers an ideal solution for industrial mobile barcode reading applications. It features a sturdy "Industrial Ruggedness" construction, Bluetooth v1.2 radio wireless communications for freedom of movement in retail, warehouse and distribution. This enables movement up to 33 feet (10m) from the base while its Adaptive Frequency Hopping (AFH) feature eliminates interference with other wireless systems. The field-replaceable lithium-ion battery enables up to 57,000 reads per full charge. The 4820i's small footprint enables hands-free presentation scanning when docked in the base. The host-powered interface and RF link extends the mobile capabilities of the 4820i by drawing power from a portable device for radio and host communications. Scanner Only, Standard Range. Cradle, cables, power supply, and accessories must be purchased separately. Cordless 2D Scanner USB kit, Standard Range. 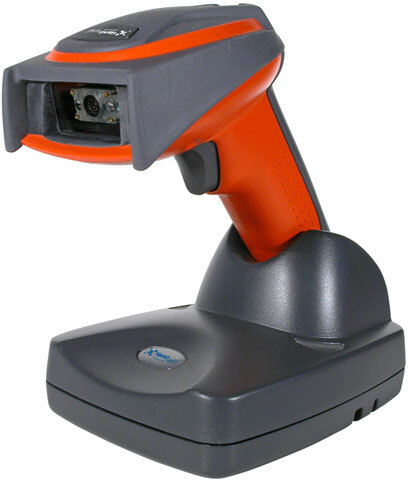 Includes 2D imager scanner, cradle, USB cable, power supply, and user guide. RS-232 kit, Standard Range. Includes scanner, cradle, RS-232 cable, power supply, and user guide. PS/2 kit, Standard Range. Includes scanner, cradle, PS/2 cable, power supply, and user guide. Scanner Only, Special Focus. Cradle, cables, power supply, and accessories must be purchased separately. USB kit, Special Focus. Includes scanner, cradle, USB cable, power supply, and user guide. RS-232 kit, Special Focus. Includes scanner, cradle, RS-232 cable, power supply, and user guide. USB Bluetooth Module kit, High Density. Includes scanner, charging only cradle (PC must support Bluetooth), USB cable, spare battery, power supply, and user guide. PS/2 kit, Special Focus. Includes scanner, cradle, PS/2 cable, power supply, and user guide.